A Joint Venture With A Builder? What are your thoughts on joint venture (with a builder). We have owned our property for some time, which is now zoned for medium density residential. Any development you do jointly, must be put in writing FIRST!!! It's called a Development Agreement. To not have a Development Agreement is "madness" and you'll end up in a screaming match and a court case. There are so many variations to how you can put together a Joint Venturs, that it is hard to set out my answer. So I will give you a general answer. All you want is fairness in any of your dealings. To establish that, you need to have your land valued at todays market value. The variations to the JV will depend on what each party is "Contributing" to the Agreement. If the builder is just contributing his construction price - that is what all builders do, so there is nothing special in that. If he is also providing "funding" for the entire project, secured by his own assets, that makes a big difference. If however he is providing funding, with security over your land, then that is not as good as the first option. If he pays you for, say 50% of the land up front, and is therefore the joint owner of the land, and you both apply for funding of the project, then that is the basis of a 50/50 JV. So, can you see how many variations there are to a JV - all of which impacts on the final profit share. The construction price the builder gives you to complete the development must be based on an agreed set of plans and specifications. A builder is entitled to his profit; but a fair profit, agreed to by an independent arbiter, such as a Quantity Surveyor - I don't know if you have them where you live, but enquire or ask an architect. At the end of the development you want your full land value (or 50%), as agreed, before profit share is calculated - the builder wants his full costs. He will have been paid by Progress Payment, as the job is being constructed. Also go to my home page and read all my Blog The Coach articles based on questions from my readers - put in on your Favourites as I add to it on a regular basis. Are you in a position to develop the property yourself? 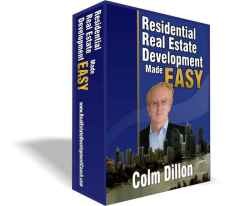 Irrespective of all the above - you must increase your Knowledge - the lowest cost investment you will make in Real Estate is an ebook that teaches you how to do it - if you doa JV with a Builder - you still need to know the questions to ask. Hope this helps you W - I could write on forever, but that's why I wrote the ebook - it's the only one available.